Symphonies: No. 7 in A, Op. 92 (1812) [40�24]; No. 8 in F, Op. 93 (1812) [24�29]; No. 9 in D minor, Op. 125, �Choral� (1824) [64�52]. Renate Behle (soprano); Yvonne Naef (contralto); Glenn Winslade (tenor); Hanno Müller-Brachmann (bass); Berlin Radio Chorus; SWR Sinfonieorchester Baden-Baden und Freiburg/Michael Gielen. Rec. live, Konzerthaus Freiburg, June 1998 (No. 7), January 2000 (No. 8), July 1999 (No. 9). Subtitles. Picture format NTSC 4:3.Sound formats: PCM Stereo, Dolby Digital 5.2, DTS 5.1. 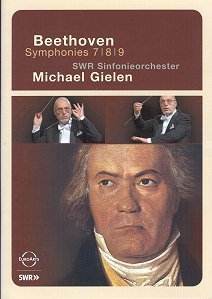 (see http://www.musicweb-international.com/classrev/2004/Nov04/Beethoven1-3_Gielen.htm and http://www.musicweb-international.com/classrev/2004/Dec04/Beethoven45_Gielen.htm ). As a whole this cycle is not made of the most inspiring stuff, despite many impressive moments and insights along the way. Camera work, too, is standard stuff with randomly-chosen string players getting the occasional moment of stardom. There is a wide variety of angles, not always logically employed. Shots of Gielen show a conductor endowed with all the technique - rather minimalist in expression, it has to be said - but not, by the look of it, a huge amount of enthusiasm. The performances reflect this. The Seventh is the earliest on the disc, dating from 1998. The Sostenuto introduction is slow by modern standards, yet the Allegro gallops along - and includes the exposition repeat. As so often with Gielen�s performances of this repertoire, there are great pluses (expert orchestral balancing in the development) balanced with minuses (the great cello and double-bass ostinato towards the end is nowhere near the omen of doom it should be). The �slow� movement is actually slow for once. Distinctly funereal, it still managed to convey a sense of unstoppable momentum, and Gielen gets excellent pianissimi from his players. What is strange about this Seventh is that it is a game of two halves. All of a sudden it takes off at the third movement, whose dynamic, almost hammered beginning introduces a fast, furious and tremendously exciting Scherzo - even the Trio has a blazing climax. A shot of the impressive double-bass line-up - around eight of them - confirms Gielen�s somewhat massive interpretation. In keeping with this, the close is no race to the finishing post, instead revealing the discipline that is a Gielen trademark. All string departments are clearly well trained for this famous movement. The Eighth - given in a hall that looks as if it is less than half-full! - begins in the most explosive of fashions. Dynamic contrasts are well marked, and there is drama aplenty. The end, though, is beautifully judged, the epitome of musicality. If the tick-tock woodwind of the second movement is not as expertly balanced as some, there are some suave and witty contributions to compensate. The horns shine in the Trio of the third movement, yet the interpretative highlight of this reading is the finale, wherein the disjunct passages - indeed the late-Beethovenian tendency towards implied disintegration - is a model of true late-Beethoven style. So to the massive Ninth. EuroArts provide subtitles in English and French for the Schiller, should you need them. A severe-faced Gielen leads his forces through a first movement that, whilst full of drama, does not really point towards the new worlds of expression the composer was clearly had in mind. Close-miking of timpani is not necessarily a bad thing in this piece, but some may find it distracting. The Scherzo is perhaps on the earth-bound side. The rustic Trio works well though. At least the flowing slow movement aspires towards higher planes. If the finale does not begin with an Almighty bolt from the blue, the relentlessness of the cello and double-bass recitatives is mightily exciting, while the March has a lovely parodistic twang to it. Soloists are generally good especially the young and focussed bass. A shame the soprano, Renate Behle, swoops up to her highest note. An interesting set of interpretations and that comment goes for the entire cycle as well as the present offering. Nothing, I remain sure, that will have you squirming in your seat in excitement, but Gielen�s agenda seems to be to pass on his wealth of experience. He gains excellent results from his players, who reveal unflagging enthusiasm.